Want to build a highly successful guitar teaching business? ... of course you do! How do you think the most successful guitar teachers build a 6-figure ($100,000 annual income) guitar teaching business? 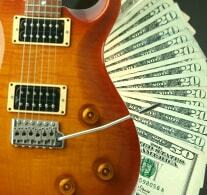 What are the ways they make money teaching guitar lessons? A. Working a huge number of hours per week teaching private guitar lessons? B. Charging a huge amount of money for every guitar lesson taught? The answers are no, no and no. The fact is, most highly successful guitar teachers do NOT use the traditional guitar teaching methods or models to make big money teaching guitar. And more importantly, it's not only about making money teaching guitar lessons - it's also about transforming the lives and the guitar playing of your students in ways that most guitar instructors are simply unaware of. Watch this free guitar teaching business video now. Simply enter your name and email, then click the "Show Me The Video" button to enter. All of your information is always kept 100% private and confidential.